(Orbis Books, Maryknoll, New York, 2016). edited by Charles E. Moore. (Plough Publishing House, Walden, New York, 2016). 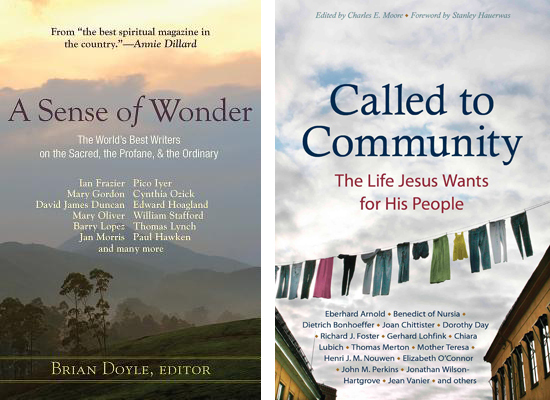 These two anthologies offer a splendid trove of insights about spirituality and Christian community. “A Sense of Wonder: The World’s Best Writers on the Sacred, the Profane & the Ordinary” collects 37 essays and personal stories from Portland Magazine. This award-winning university magazine has featured the work of writers such as Mary Gordon, Mary Oliver, William Stafford and Pico Iyer, all included in this stunning collection. Brian Doyle, editor of Portland Magazine, has gathered an impressive, wide-ranging assortment of pieces. His own contribution, “The Late Mister Bin Laden: A Note,” is an original reflection on the death of Osama bin Laden that laments the squandering of God-given gifts that his life represented. One of the most charming and insightful essays is Holy Cross Father Charles Gordon’s “Why I am a Priest.” He explores, with both humor and gravity, the many reasons that led him to his vocation. All in all, “A Sense of Wonder” is a stirring and heartfelt book that inspires the reader to ponder both the everyday and the eternal. “Called to Community: The Life Jesus Wants for His People” gathers 52 different essays on the challenges of living in Christian community. Most of the authors have actually walked the talk, living in intentional community and thereby gaining a deep understanding of its challenges. Works by St. Benedict of Nursia, Lutheran theologian Dietrich Bonhoeffer, Dorothy Day, Trappist Father Thomas Merton, Father Henri J. M. Nouwen, Mother Teresa and Jonathan Wilson-Hartgrove, among many others, are included here. Also in this section, Bonhoeffer’s (1906-1945) “A Visible Reality” discusses some of the key New Testament passages that underscore the importance for Christians of living in community. In Part IV, “Beyond the Community,” the American clergyman Eugene H. Peterson (born 1932) discusses the problem of sectarianism in Christian community, while Day (1897-1980) contributes the final essay that encourages us to practice the spiritual works of mercy. The range of authors and faiths represented is commendable. It includes Catholic, mainline Protestant, Mennonite, Quaker and other perspectives, both American and international, lay and clerical. This is a stellar contribution to our understanding of the whys and wherefores of Christian community. The 52 selections seem perfect for a year of weekly group study and the detailed discussion guide in the appendix is particularly useful for this purpose. “Called to Community: The Life Jesus Wants for His People” is a thoughtfully compiled and well edited guide to the subject. Roberts is the author of two books on Dorothy Day and the Catholic Worker and teaches journalism at the State University of New York at Albany.